Who was Thomas Wickham (1624-1688)? Thomas Wickham (1624-1688) was a Puritan English settler who established himself in Wethersfield, Connecticut in about 1648. He earned his living as a wool merchant, while his wife Sarah ran a school for girls. Setting a precedent for large families, they had two daughters and six sons (one died in infancy). Because Thomas has had a substantial number of descendants, including many prominent ones, he is an object of study by many historians and genealogists. Thomas' descendants slowly migrated southward towards Virginia and westwards across upstate New York, Ohio, and other parts of the Midwest. Today, this extended family has representatives throughout the United States and even other countries. Who are some of Thomas Wickham's (1624-1688) more prominent descendants? Charles Preston Wickham (1836-1925) - Charles was a representative of the millions of Americans who migrated westward. He served with distinction in the Union Army during the Civil War, rising to the rank of Colonel. Afterwards, he served two terms in the U.S. Congress for the State of Ohio, becoming chairman of the Committee on Coinage, Weights, and Measures. Charlotte Wickham (1841-1863) - Raised as an orphan, Charlotte went on to marry Rooney Lee, the second son of General Robert E. Lee. Although she lived a life of wealth, it was overshadowed by the traumatic events of the Civil War, which led to her early death. Clarence Horace Wickham (1860-1945) - Clarence was a Connecticut industrialist and philanthropist. Together with his father Horace, he made many important innovations in the envelope business, including developing the window envelope. He left his beautiful estate, The Pines, to be used by the public after his death. Renamed Wickham Park, this property today consists of 250 acres of gardens, woodlands, and open fields. Elinor Catlin Wickham (1886-1925) - Elinor Wickham married publishing heir Joseph Pulitzer II and was the mother of Joseph Pulitzer III..
Evelyn Wornham Wickham (1895-1988) - Evelyn was a researcher who published a wonderful genealogy of the Wickham Family in the 1970s. George Duncan Wickham (1772-1845) - George was a prominent businessman based in Orange County, New York. He established and served as president of the Bank of Orange County for over 30 years. He was also heavily involved in establishing turnpikes, canals, and railroads throughout New York State. In addition, he served as a brigadier general in the state militia. Harvey Wickham (1872-1930) - Harvey was a well known pianist, organist and author. He made brilliant criticisms of Freud and Einstein, then helped defend the Roman Catholic Church during the European crises of the 1920s. James Parker Wickham (1906-1930) - At age 23, volunteer fireman James Parker Wickham lost his life in the line of duty. He left behind a young wife and two small children, ages 18 months and 3 months. John Wickham (1734-1835) - John lived to be 100 and was the patriarch of a vast clan living in Appalachian Ohio. At least seven of his descendants died fighting for the Union during the Civil War. John Wickham (1763-1839) - John was one of early America's wealthiest men and a noted constitutional lawyer. After narrowly escaping conviction after being arrested as a Loyalist spy, he settled in Richmond, the newly designated capital of Virginia. He became a prominent Federalist and, in a spectacular and unexpected victory, successfully defended Vice President Aaron Burr from charges of treason. He also built the acclaimed Wickham House and was a highly successful horse breeder. John Adams Wickham, Jr. (1928- ) - John was a United States Army general who served as the U.S. Army Chief of Staff from 1983 to 1987. He was named by Army Times as one of the ten leaders who most changed the Army. Please refer to the many excellent biographies available elsewhere online. John Clements Wickham (1798-1864) - John sailed with Charles Darwin aboard the HMS Beagle Afterwards, he served as Police Magistrate and Government Resident for the first 17 years of Brisbane, Australia's existence. Joseph Dresser Wickham (1797-1891) - Joseph was an educator and minister who served for 25 years as headmaster of the Burr Seminary, one of Vermont's leading secondary schools. He lived to the age of 95 and was for three years Yale's oldest graduate. Joseph Horatio Wickham (1911-2000) - Joseph was a prominent Brevard County, Florida politician. Beautiful Wickham Park in Melbourne, Florida is named after him. Matilda Briggs Wickham (1834-1901) - Matilda Briggs Wickham was married to successful banker Quincy Winthrop Wellington and she was the mother of Adelaide Houghton, wife of ambassador and Corning Glass heir Alanson B. Houghton. Parker Wickham (1727-1785) - Parker was a well-to-do political leader whose outspoken views cost him everything. Living on eastern Long Island during the American Revolution, Parker was elected to office as a Loyalist, earning him many political enemies. In a decision that remains controversial to the present day, the State of New York confiscated Parker's property and banished him from the state after the war. His most famous statement was "I will not raise my hand against my king." William Wickham (1819-1881) - William Wickham was a highly respected political leader of Suffolk County, New York. Born into a politically prominent family, William earned his fortune as a lawyer and farmer. He was elected District Attorney of the County four times, but it was a murder involving his brother that became the most memorable case of his career. William Hull Wickham (1832-1893) - William was a reformist New York City Democrat who dared to take on mighty Boss Tweed. After an epic struggle, a disgraced Boss Tweed was sentenced to prison and William was elected Mayor. William Hull Wickham (1846-1925) - William was a New York City chemist who helped grow pharmaceutical drug firm McKesson & Robbins into the largest health care company in the world. Williams Carter Wickham (1820-1888) - A descendant of several noted Southern families, Williams was born into the purple of antebellum Virginia society, where he grew up on a 3,200 acre plantation. Though highly opposed to Secession and the Civil War, he volunteered for military service, quickly rising to the rank of general after an impressive record in the Confederate cavalry. After the war, he became a Republican and worked tirelessly to reunite the South with the rest of the country. He also served as president of the C&O Railroad. Woodward A. "Woody" Wickham (1942-2009) - Woody was VP of the MacArthur Foundation and an influential figure in the field of independent film. He also founded the Wickham Butterfly Garden and championed the film "Hoop Dreams". Please refer to the many excellent biographies available elsewhere online. Other notable descendants without the Wickham surname include fashion designer Gloria Vanderbilt, actress Sigourney Weaver, writer Ian Frazier, explosives expert Kenneth Bingham Quinan, journalist Joseph Pulitzer III, and TV host Anderson Cooper. Click here to see a detailed family tree with famous cousins, including a special section on Edmund Fanning (1739-1818). Was Thomas Wickham (1624-1688) the first Wickham to make a landing in the American colonies? No, there was a Parson William Wickham living in the Virginia colony as early as 1619. What is the place of origin and pedigree of Thomas Wickham (1624-1688)? This can seem hard to believe for the uninitiated, but researchers have spent thousands of hours trying to answer this question. Over the years, researchers have proposed many theories of Thomas' origins, with possible locations including Yorkshire, Sussex, Kent, Berkshire, and Gloucestershire. What is known is that based on his associations and business transactions he appears to come from a prosperous and established family of either farmers, tradespeople, or clergy. There are some hints, based on a lawsuit that he filed, that he may have been estranged from certain family members due to issues of inheritance, perhaps explaining why kinship information was not passed down to subsequent generations. Besides poor records, the search for Thomas' parents is complicated by the large number of Wickham families who were living all over England by the year 1600. One of the most intriguing theories is based on reports of a very old, handwritten Bible which was said to be found in the attic of a two room shack on a farm in Miller County, MO. It contains a genealogy that states Thomas Wickham's father was Richard Wickham (born 1594) and his grandfather was Seward Wickham (born 1577). Then there is a gap in the genealogy before it picks up again with Sir Robert Wickham, who was knighted in 1301 and married Catherine, daughter of Sir Reginald Waterville. The rest of the genealogy is as follows: Sir William De Wickham knighted 1273 / Sir Rodulphas De Wickham knighted 1238 / Sir Robert Walchelin granted thirty acres at Shipton to Bruerne Abbey, 1147. They were members of the English gentry associated with Swalcliffe, Oxfordshire, England. The property where the Bible was found is owned by descendants of Noyes Wickham who moved to Miller County in the early 19th century. The Bible is also said to contain text indicating that Thomas briefly lived in Massachusetts with his brother Richard before moving to Connecticut. It should be noted that the older part of this genealogy is very similar (but not identical and sometimes conflicts) to a section of the genealogy that was published in 1852 by C. Wykeham Martin in "An Attempt to Establish the Descent of William of Wykeham, Bishop of Winchester, From the Family of Wykeham of Swalcliffe, Co. Oxford". Often using alternative spellings such as "Radulphus de Wykham", this second genealogy covers the same line of descent, but goes back even earlier, to Walchelin, father of Robert, who is listed in the Domesday Book of 1086. Another oft-touted theory is that Thomas was from the Yorkshire area since he may have settled in Connecticut as part of the company of the Reverend Ezekiel Rogers, which had its origins in the vicinity of Rowley, Yorkshire. There is an ancient, landed Wickham Family living in Yorkshire which is possibly related, although there is no known documentation to support this. This prominent Yorkshire brood originates from William Wickham, who became Bishop of Winchester in 1595, (not to be confused with the more famous William of Wykeham (1326-1404), who also served as Bishop of Winchester). His son Henry Wickham, M.A., of King's College, Cambridge, was ordained deacon at Cawood in 1614 and priest at Bishopthorpe in 1617, and also served as rector of Bedale. He was admitted to the stall of Fenton at York in 1614; to the rectory of Bolton Percy in 1617; to the stall of Beckingham at Southwell in 1620/1; and to the archdeaconry of York in 1623/4. Henry's mother Anthonina was the daughter of William Barlow, bishop of Chichester, pointing to another Chichester connection. Henry married twice, first to Annabella, daughter of Sir Hen. Cholmeley, of Thornton, co. York, and secondly to Elizabeth, daughter of John Browne, Esq., of Fidlers, co. Essex. Henry died on July 2, 1641 and was buried in the York Minster. Tobias Wickham, his eldest son by his first marriage, became Dean of York and was the great-great-grandfather of William Wickham (1761-1840), who was born in Cottingley Hall and studied at Harrow, Christ Church College at Oxford, and the University of Geneva before becoming a British masterspy who thwarted the French invasion of Ireland in 1797. In 1802, William was named chief secretary for Ireland, while his nephew, noted businessman and liberal politician Henry Wickham (1800-1867), served as an M.P. for Bradford, Yorkshire from 1852 to 1867, and was also a partner in the Low Moor Iron Works. Yet another possibility is that Thomas was cousins with merchant John Wickham of Bridgehampton, Long Island, whose grandfather was John Wickham of Chipping Sodbury, Gloucestershire. A son of Henry Wickham who died in 1706, John lived only about a mile away from the home of Thomas' son Joseph, during a time when eastern Long Island had only a thousand or so people living there. John, who adopted the surname Wick later in life and served as sheriff of Suffolk County, (then the highest post of local government), became the subject of local legends after his death. Then there is a family genealogy that states that Thomas was born on October 19, 1624 in Wethersfield, CT to Cecelia and Thomas Wickham, born in 1600 in North Murcham, Chichester, Sussex, England. Since the Pilgrims landed in 1620, this would indicate a very early arrival for the Wickhams, but it should be noted that Wethersfield itself was not founded until 1634, though perhaps there were already some English settlers in the area. It may be that Thomas was related to the Chatfield family of Chichester, Sussex, members of which also emigrated to the American colonies at the same time and who had business relations with him. There is a 1638/9 will by a Jane Chatfield, whose first husband was George Wickham, which mentions her grandson Thomas Wickham. Assuming this is the same person, it is then possible to use wills and land records to go back several more generations. This theory was studied in great detail by Alan A. Wickham, who scoured the parish, probate and manorial records of Sussex with remarkable thoroughness. While his efforts revealed that there were indeed many Wickhams who lived in Sussex around 1600, the critical connection between Thomas and the Sussex Wickhams is based on circumstantial evidence which does not provide absolute proof. A variation of this genealogy is that Thomas' father was the same, but his mother was Martha Chitty (instead of Cecelia) and that Thomas was born in Chichester, Sussex, England in 1624. Under this scenario, he had two brothers, Richard and Daniel, who moved to Rowley, MA. It has even been postulated that Thomas' family spent time in the Caribbean since there are records of Wickhams as early as the 1600s living on Antigua (colonized in 1632) and Barbados (colonized in 1625). In the early 1700s, there were four Wickham brothers living on Antigua, where they owned large sugar plantations. During the revolt of 1710 against the colonial governor, they sided with the royal government and sent a petition to the Queen asking for assistance after Governor Parke was assassinated. In the following years, they continued to serve in the assembly. Some of the Antigua/Barbados Wickhams eventually returned to England, including the ancestors of Sir Henry Wickham (1846-1928), who was knighted after he smuggled 70,000 rubber tree seeds out of Brazil for the Royal Botanical Gardens at Kew. His exploit destroyed the lucrative rubber monopoly of the Brazilian planters, but permitted the development of rubber plantations in Asia. Other "origin stories" have Thomas coming from the Isle of Wight, being a descendant of the Earl of Wykeham, or coming over on the Mayflower under the name Wickerhamshire with two brothers who died (or lived, depending on which version is to be believed - yet another version claims there were five brothers). Some subsitute a certain Israel Wickham for Thomas, saying that he was born about 1630 in Kent County, England, moved to Rhode Island around 1663 and then died in East Hampton, Long Island, NY in 1687. What is the meaning of the surname Wickham? It is generally accepted that the term Wickham is of Old English origin and refers to a Romano-British settlement or homestead, particularly a dairy farm. The surname itself developed after residents of a place called Wickham started to refer to themselves as being "of Wickham," which was later shortened to just "Wickham." There are more than two dozen places scattered across England that use the name Wickham. If the geneaology of the Bible from Miller County, MO is correct (see above), then the surname of Thomas Wickham (1624-1688) derives from Wykham in Oxfordshire, UK. This ancient mansion was located near Swalcliffe in the 1200s and 1300s, but has long since vanished. What are some of the spelling variations of Wickham? Prior to about 1500, the most common spelling of the name was Wykeham, which is pronounced the same way. After about 1500, the common spelling changed to Wickham, although some of the more established branches stayed with Wykeham. However, numerous other spellings are known, including: Wykham, Wycham, Wykhame, Wekeham, Whickham, Wickam, Wickhams, Wyckom, Wikeham, Wicham, Wixom, Weekham, Wieckham, and Wikham. When did the Wickham surname first appear? In the English historic record, the first appearance of the surname was Wulfric aet Wicham in 955. It is not known if this was a relative of Thomas Wickham (1624-1688). The short answer is "No." There are Native American Wickhams, black Wickhams, Irish Wickhams, and English Wickhams, even Welsh and French Wickhams. Though different "races" sometimes have children together, most of these lines have remained distinct for hundreds of years. Even if you only consider the English Wickhams, they are not all related, given that the surname derives from a place-name and there are more than two dozen places in England using the name Wickham. It also follows that two distinct families living in the same town could both say they were "of Wickham." Still, it is clear that a very substantial number of English Wickhams are related. Further complicating the matter are instances in recent times of people modifying their name to Wickham from names such as Wick, Wickersham, or even the German surname Wichman. According to some researchers, many of the Irish Wickhams are descendants of English nationals who migrated to English controlled enclaves of Ireland some time after the Norman takeover of Ireland that began in 1169. Probably the easiest family to confuse with the family of Thomas Wickham (1624-1688) is the family of Thomas Matthew Wickham (1730-1790), who also went by the surname Wickingham. Born in England, he married Mercy Huntting (or Hunting) on July 23, 1761 in Dedham, Norfolk, Massachusetts. They had seven children, plus there was another child born in England from a previous marriage. The eldest child, Joseph, moved to Rome Township, Athens County, Ohio and had numerous descendants. There are plenty of other distinct lines, including that of U.S. Army General Kenneth G. Wickham and of folk artist Enoch Tanner Wickham of Palmyra, Tennessee. Regarding the black Wickhams, there is the family of W. Casius Wickham and Sarah Scott, married in 1880. Casius was the son of John Wickham, a slave who was born in Hanover County, VA during the early 1800s. Hanover County was also the site of a plantation owned by John Wickham (1763-1839), the white attorney who won an acquittal for Vice President Aaron Burr during his treason trial. The similarity in names and location has sparked speculation of a connection between the two, and it is believed the black Wickhams adopted their surname from this white family. However, no further relationship has ever been uncovered, despite an exhaustive 10 year research effort by one person to determine if "miscegenation during slavery" occurred in this instance. Notable members of this black Wickham clan include DeWayne Wickham, the USA Today columnist known for his unique views on race relations. In neighboring Henrico County, there were also Johnson and Jacob Wickham, who were owned by Master Sherman from birth and served in the United States Colored Cavalry during the Civil War. There is a separate set of black Wickhams in the Caribbean, a legacy of Wickham-owned plantations in that area. Was Thomas Wickham (1624-1688) related to the great Bishop William of Wykeham (1326-1404)? The famous Bishop William of Wykeham (1326-1404) was from the village of Wickham in Hampshire. From humble beginnings he rose to great power as a key administrator for both Edward III and Richard II. He also founded Winchester College and New College, Oxford. In addition, he built the most outstanding portion of Winchester Cathedral. Despite gaining fame and wealth, he had a reputation for always putting the public interest first. His most famous statement was "Manners makyth Man." After receiving his education from Winchester Grammar School, William began his career as an architect and surveyor, serving first the Bishop of Winchester and then, at age 23, King Edward III. While supervising several important building projects, including the reconstruction of Windsor Castle, he gained the King's favor and was rewarded with the keepership of numerous royal castles and manors. After being ordained a priest in 1362, he was named keeper of the privy seal in 1364, a key civil office. In 1366, he was elected as Bishop of Winchester and in 1367 was appointed chancellor of the kingdom, the most powerful office in England at the time. But in 1372, he was forced to resign his civil offices due to unfavorable developments in the Hundred Years War with France. Free to focus on his episcopal duties, he began a campaign of reform, especially at Selborne Priory and the hospital of St. Cross. He also began working on his educational foundations, but came under serious legal and political attack by John of Gaunt, the wealthy duke of Lancaster and fourth son of Edward III. The death of Edward III in 1377 ended these troubles and with the accession of Richard II, William received a full pardon. He continued his educational work, founding Winchester College and New College, Oxford. In 1389, he was re-appointed chancellor by Richard II, but resigned the position after about two years. He then began rebuilding of the nave of Winchester Cathedral in 1394, transforming it from Norman to Perpendicular. The last three years of his life were spent in retirement and he was buried in an altar-tomb on the south side of the nave of his cathedral. In 1595, another William Wickham became Bishop of Winchester after serving as Bishop of Lincoln, but held the position for only about a year and is not nearly as well known. Since he was a bishop of the Catholic Church, it is not certain that William of Wykeham had direct male descendants, although he was not ordained as a priest until about age 36. In fact, the bulk of his estate went to the descendants of his sister, who kept the Wykeham name because of its prestige. Making the issue even murkier is the fact that William's father often used Long (or Longe) for a surname, and may have changed it to Wykeham only after moving to the village of Wickham. If Thomas was related, as is often reputed, it would probably be as a cousin, but since his pedigree is unknown, a final determination cannot be made. Bishop William of Wykeham is known to have at least one cousin bearing the Wickham surname, his cousin William, husband of Alicia Uvedale, to whom the Bishop left the manors of Burnham and Brene in a 1397 will. What is the Old House in Cutchogue, New York? Completed in 1649, the Old House (pictured above) is considered an outstanding example of domestic 17th century English architecture and is one of the oldest houses in New York State. Its most famous resident was Parker Wickham (1727-1785), whose Loyalist convictions led to the seizure of his property and his banishment at the end of the American Revolution. The house is open to the public during the summer and is part of a historic complex on the village green in the center of Cutchogue, NY on the North Fork of eastern Long Island. 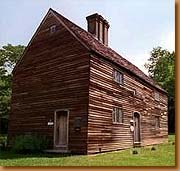 What is the Wickham House in Richmond, Virginia? Completed in 1812 for one of Richmond's foremost lawyers, John Wickham (1763-1839), this National Historic Landmark (see picture) is a showplace of neoclassical design. It was designed by Alexander Parris, architect of Virginia's Governor's mansion and Boston's Faneuil Hall. As one of early Richmond's wealthiest citizens, John intended for his magnificent home to represent his outstanding wealth and reputation. Within the house lived John, his two sons from a previous marriage, his wife (who rapidly expanded the family with 17 more births), and his father-in-law Dr. James McClurg, a former mayor of Richmond. The recently restored house is open to the public and is part of the Richmond History Center. The house is located at 1015 E. Clay Street in downtown Richmond. Are Wickham family members related to anyone rich and famous? The following family tree shows some of the more interesting relationships to other prominent families. Are there any Wickham family castles? Some of England's prettiest castles have associations with the Wickham family, but Thomas Wickham (1624-1688) has no documented connection to the owners. Leeds Castle, near Maidstone outside of London, was owned by the Wykeham Martins from 1821 to 1926. Broughton Castle, located near Banbury, is depicted in the movie "Shakespeare in Love" and many others. It was purchased by Bishop William of Wykeham (1326-1404) in 1377 and is now owned by the Fiennes, who are descendants of his family. William of Wykeham also used Bishop's Waltham Palace, where he died in the Great Tower. This castle was later destroyed by Oliver Cromwell, although the ruins are open to visitors. Can Wickhams attend Oxford University for free? It used to be that kin of Bishop William of Wykeham (1326-1404) could attend Oxford (and Winchester) without paying tuition. Even kin without the Wykeham or Wickham name were eligible. However, as the centuries passed and the Bishop's kin grew more numerous and less related, the school's trustees began challenging some of the kinship claims. Other students began seeing the situation as a scandal. Eventually the number of scholarships were limited, and in 1858 the entitlement of free tuition was abolished at Oxford. Is there a Wickham Family reunion? There is a reunion held each year in the upstate New York town of Hector. It is for the the descendants of William and Phoebe (Rose) Wickham, first permanent white settlers of Schuyler County, New York, but ALL Wickhams are welcome, so bring a large dish-to-pass. It is traditionally held on the 3rd Saturday of August. August 2005 was the 120th reunion! To see programs from past reunions, click here. There are of course numerous other reunions held by various family branches. Are there any off-line resources available that pertain to the family of Thomas Wickham (1624-1688)? Below are some non-Internet resources. This information largely serves as the bibliography for this website. "The Ancestors of James Wickham and his Wife Cora Prudence Billard" - Professionaly researched book that covers Wickham and related families up to 1935. Available from Higginson Books or Barnes & Noble. Most relevant for close relatives of James Wickham or his wife of Cutchogue, New York. "The Wickham Claim" - Book by Dwight Holbrook which covers the confiscation of property belonging to Parker Wickham of Cutchogue, New York at the end of the American Revolution. Written in a dry and obscure manner, but contains historical and legal information not duplicated elsewhere. "The Descendants of Noyes Wickham, Senior of Ridgebury, Orange Co., NY" - Book written by Evelyn Hale which contains detailed genealogical information. Out of print, but available in some libraries. "George Duncan Wickham: A Biography" - A 70-page book published in 1994 and written by Henry Pomares which contains biographical information on George Duncan Wickham (1772-1845), a Goshen, New York businessman. Available from the publisher, Goshen Chamber of Commerce. "Middletown: A Biography" - A 201-page book published in 1928 and written by Franklin B. Williams which covers the history of Middletown, Orange County, New York, which Samuel Wickham from Southold, Long Island founded in 1756. Extensive information about the roles of various Wickhams over the years. "Federal Justice in California: The Court of Ogden Hoffman, 1851-1891" - A 324-page book published in 1991 and written by Christian G. Fritz, an important scholar of legal history. Book is mainly a serious analysis of Hoffman's legal career, but also contains information in the first chapter about Hoffman's childhood, including his relationship with his great-uncle George Duncan Wickham (1772-1845), a Goshen, New York businessman. Available from the publisher, University of Nebraska Press. "The Virginia Magazine of History and Biography" - Has article called "Landscape and Memory in Antebellum Virginia" by Joan E. Cashin in the edition from October 1994, Volume 102, Number 4. Contains detailed information about Virginia planter William Fanning Wickham, father of Confederate general Williams Carter Wickham (1820-1888). Available from the publisher, Virginia Historical Society. "The Edge of the South: Life in Nineteenth-Century Virginia" - Book edited by Edward L. Ayers and John C. Willis with chapter called "From Slavery to Freedom: Hickory Hill, 1850-80" by Gregg L. Michel. Contains detailed Civil War-era information about William Fanning Wickham, Williams Carter Wickham (1820-1888), and their Hickory Hill Plantation located outside of Richmond. "Portraits in the Historic Hanover County Courthouse" - Literature which includes biographical sketches of Confederate general Williams Carter Wickham (1820-1888) and his son Henry Taylor Wickham (1849-1943), a Virginia state senator. Ashland, VA. (1985), p.8-9. "The National Cyclopaedia of American Biography" - Book which includes biographical sketches of Confederate general Williams Carter Wickham (1820-1888) and his son Henry Taylor Wickham (1849-1943), a Virginia state senator. New York, NY. v.13 (1892-1906), p.605-606. "The General Assembly of the Commonwealth of Virginia, 1940-1960" - Book by Edward Griffith Dodson which includes biographical sketch of Henry Taylor Wickham (1849-1943), a Virginia state senator. Richmond, VA. (1961), p.598. "Biographical Register of Members, Virginia State Convention of 1861" - Book by William Harris Gaines which includes biographical sketch of Confederate general Williams Carter Wickham (1820-1888). Richmond, VA. (1969), p.79. "Journal of the Society of Architectural Historians" - Journal which includes article "Mr. Jones goes to Richmond: A note on the influence of Alexander Parris' Wickham House". Philadelphia, PA. v.43, no.1 (Mar. 1984), p. 71-74. "Robins Island Reflections: 1639-2001" - The ultimate guide to Robins Island, the storied, 445-acre island owned by Parker Wickham (1727-1785) until it was confiscated after the end of the American Revolution. Filled with pictures and interesting tales, the 274-page book was written by Betty Tuthill Wells, whose brother served as caretaker for the island for many years. "Heaven and Earth: The Last Farmers of the North Fork" - Book written by Steve Wick which focuses on the farming operations of Wickham Family members living on the North Fork of Long Island, NY from the 17th century to the 1990s. Well researched and contains large amounts of family information, but unfortunately tends to portray its subjects as struggling individuals. Out of print, but available in some libraries. "Family" - Book written by Ian Frazier, a Wickham descendant, which focuses on Wickham Family members living in Norwalk, OH during the 19th and 20th centuries. In this treasure trove of genealogical data, the author makes a point of waxing philosophically about the reputed decline of Protestant families, despite being a Harvard graduate and Thurber Humor Prize winner, who has earned a comfortable living as a staff writer for The New Yorker and author of several best-selling books. "The Memorial of Joseph Parker Wickham" - Transcript of the records pertaining to Joseph Parker Wickham's effort to receive compensation from the British government following the seizure of the property of his father, Parker Wickham of Cutchogue, New York. Original is at Public Office Record, London and a copy is at the New York Public Library. William Wickham Papers - Collection of records pertaining to William Wickham, a prominent Orange County, NY and New York City attorney at the time of the American Revolution. Kept at Goshen Public Library, Goshen, NY. "Wickham" - Manuscript written by Charles Arthur Hoppin in 1899 which covers information on Wickham family members, particularly in New England. Includes a section on the Wickhams of Rowley, MA. "In Memoriam, Horace John Wickham, April 1 1836 - May 22 1914" - Biography written by Charles Arthur Hoppin in 1914 about New England businessman and inventor Horace John Wickham, father of Clarence Horace Wickham (1860-1945). "Parks & Recreation" March 1968: 10-11 - Article called "A Private Park Called Wickham" about Wickham Park in Manchester, CT.
"The Hartford Times" 12 April 1965:29 - Article "Famed Wickham Park Oriental Garden Renovated for Spring" about Wickham Park in Manchester, CT.
"The American Enterprise" 1917:78-79 - Contains a brief biography by James A. Martin about New England inventor Horace J. Wickham. "The New England Historical and Genealogical Register (NEHGR)" - Founded in 1847, this scholarly publication provides detailed, well researched articles. On pages 260-76 in volume 150, there is a July 1996 article "Thomas Wickham of Chichester, Sussex, and Wethersfield, Conn." by Alan A. Wickham and James W. Petty which documents the evidence that immigrant Thomas Wickham was from Sussex, England and related to the Chatfield family of East Hampton, NY. "The American Genealogist (TAG)" - Article "On the Wickham Ancestry" by Evelyn Wickham Hale and Burnell E. Staffin which examines the possibilty that immigrant Thomas Wickham was related to the Wickhams of Chipping Sodbury, England, 58 :181-184. "History of the Fanning Family" - A highly regarded, two-volume genealogical record written in 1905 by Walter Frederic Brooks which covers the descendants of the emigrant ancestor Edmund Fanning from 1653 to 1900, with additional data stretching back to 1197. While the obvious focus is on Fanning family members, this book also contains substantial information about related Wickham family members. The Valentine Museum/Richmond History Center - Largest artifact of this museum is the "Wickham House," a mansion built in 1812. A few displays related to the Wickhams, mainly limited to those from the Richmond area. Located at 1015 East Clay Street, Richmond, VA 23219. Phone: (804) 649-0711. Wickham Family Papers (1754-1977) - Collection of paperwork and letters from John Wickham (1763-1839) and his family kept by the Virginia Historical Society. Totaling more than 10,000 items, including diaries, correspondence, farm records, wills, and legal records. Wickham Family Papers (1766-1912) - Another collection of paperwork and letters from John Wickham (1763-1839) and his family kept by the Virginia Historical Society. Totaling more than 5,000 items, including diaries, letters, records, and material from the Burr trial. Arthur Wickham's Research Files - Large collection of information compiled by amateur genealogist Arthur Wickham of Lincoln, Nebraska and now owned by Nebraska State Historical Society (1-800-833-6747, ask for file "MS3564 John F. Wickham papers"). Approximately 300 pages of family trees, plus correspondence with other family members. Warning: information is known to contain a number of errors. "An Attempt to Establish the Descent of William of Wykeham, Bishop of Winchester, From the Family of Wykeham of Swalcliffe, Co. Oxford" - Written in 1852 by C. Wykeham Martin, this book is filled with "conjectured descents" and falls short of modern genealogy research standards. Though unable to prove his thesis, he does gather a lot of useful information about ancient Wickham lines of descent in England. "Medieval Archaeology" - Academic journal which includes article "English Place-Names Derived from the Compound Wicham" by Margaret Gelling, 11:87-104. Please send all comments to: Please send all comments to: jsw2007@msn.com.